Landscape+Urbanism: Grey to Green: Action? I mentioned previously the announcement of a proposal by Portland City Commissioner (and mayoral candidate) Sam Adams for 'Grey to Green'... after an epic roll-out - there has been little talk since. Well that has changed in a flash with another big invite to City Council for an event this week to take some action. "Portland is blessed with abundant rainfall. With it, our city grows lush and beautiful. But all of this rain comes with a challenge: our annual average of 37 inches creates a staggering 20 billion gallons of stormwater runoff every year. 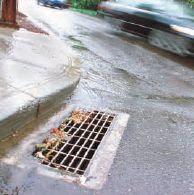 Without proper management, stormwater runoff can damage our watersheds, rivers, and streams. The good news is that Portland is well past the days of simply funneling stormwater into pipes that release fast-moving, dirty water directly into once-pristine rivers and streams. In 2005, City Council embraced a holistic approach to watershed health in adopting the Portland Watershed Management Plan. With this new strategy and thanks to on-going help and a steady application of pressure from organizations like the Audubon Society of Portland and the Urban Greenspaces Institute, we are ready to step up our investments in clean rivers and streams to preserve our urban watersheds for generations to come. We're calling this shift in the way we do business "Grey to Green". 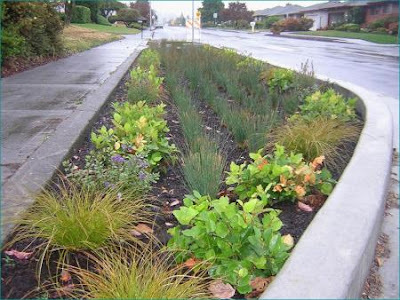 Portland is at the forefront of using "green infrastructure" - sustainable stormwater management technologies that mimic natural systems. The city is dotted with parking lot swales, green streets and rain gardens that filter stormwater pollutants and allow water to soak into the ground, replenishing groundwater supplies. But repairing our urban landscape is not enough. We also need to restore and preserve existing natural areas throughout our city, by fighting invasive weeds, restoring native plants, protecting our most critical natural land, and replacing culverts that harm fish. These are not new approaches, but shifting our focus and resources from grey to green is a vital step toward improving the health of our watersheds and rivers. With this shift comes the added benefit that we don't get from miles of piped sewers - cleaner air and water, reduced urban temperatures, and increased and improved habitat. And, these approaches often cost less than traditional piped systems. What excites me most is that this new approach allows every residence and business to be a part of the solution, whether it's installing an ecoroof or simply planting a tree. Grey to Green is an investment that makes sense. And we are ready to act now. A reception and City Council presentation on the Grey to Green initiative will be held on Wednesday, April 16th at Portland City Hall (1221 SW 4th Avenue)." All of this sounds great. My reaction to all of this has been first: elation! as there is destined to be support financially which will encourage those on-the-fence developers or agencies to go-ahead with the ecoroof or green street project. Is this true? I truly hope so. And while I laud our lofty goals to get Portland some significant square footage, I also want to make sure there is adequate funding for Research and Development of all of these concepts. Acres and miles are great - but if we don't continue to improve the quality and function - as well as stop repeating mistakes - on future facilities, will we really have acheived our goals. For instance, since the first ecoroof project was installed, our local knowledge of what works has increase manifold. In spite of this, there are still mistakes being made that are preventable (in contrast to mistakes made while trying to push the boundaries, which are good, if we learn from them). So as we embark on Grey to Green - let's remember to include funding and opportunities for R&D, as well as promote and encourage information sharing -- to make all of that Green the best it can be!